At the end of last month nothing was happening in the garden or with me. In fact I was feeling down – illogically really because winter has been very short, intense but short. This week we’ve had warm sunny days and also days when the wind is so cold and so strong it was bending the trees in half. 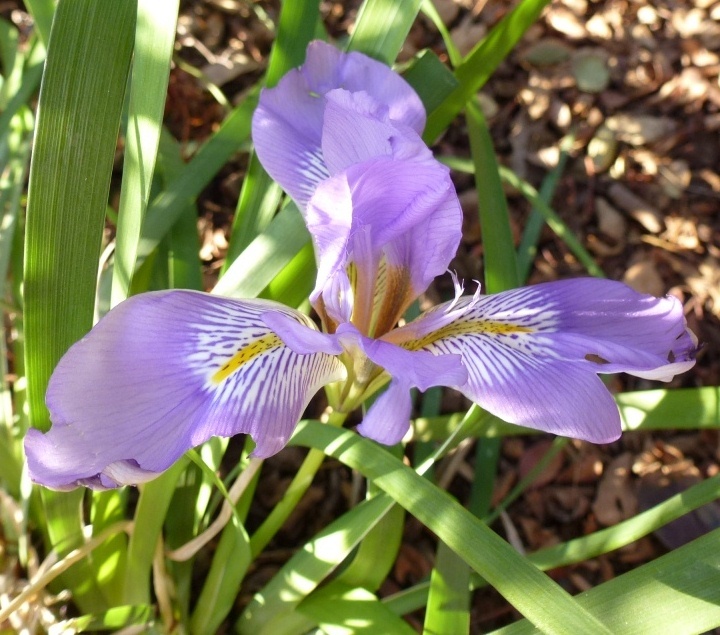 The snow has all melted and with the warm sun much is growing; I found that Iris unguicularis has flowered for the first time – I know that they don’t like being disturbed but I had hoped for flowers last year – so far there is one bloom, I hope there will be more. They are planted under Rosa mutabilis and I would really like to move them to a better position but it would be sad to lose the flowers for another couple of years. 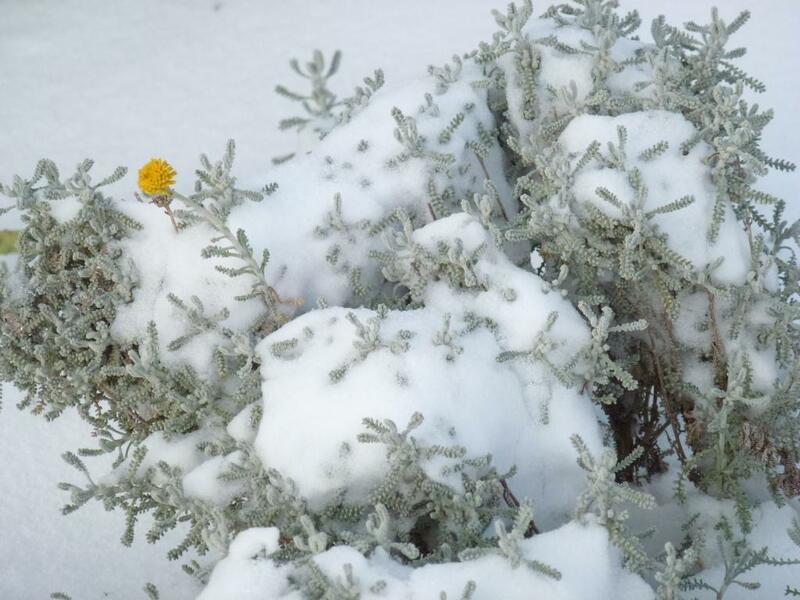 Under the snow I found an Achillia blooming, but the cold wind has burnt the flowers now. Tulips are emerging from the soil, I am so happy as I held to my resolve and I didn’t buy or plant any bulbs last autumn. I long for their bright hues and beautiful forms to fill the garden with colour and announce that it really is spring! When I read the Alberto at Altroverde was cutting back his grasses I thought he was being a little premature; last year I did mine towards the end of March. 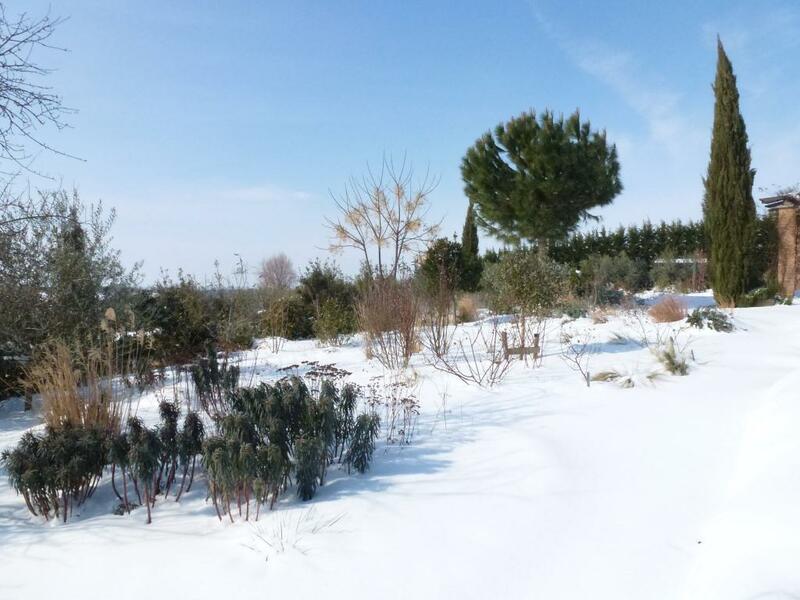 But I thought I should check and almost all the grasses including the Miscanthus (that I consider to come into leaf late) had fresh green leaves emerging from the base; the wind and snow had burnt some a little but not enough to do permanent damage. So another job to be completed ASAP. On Sunday I decided the time had come to remove some of the Gaura that smothered the roses in the circular rose bed. The roses are planted in four groups of three and Gaura had germinated close in around the roses to the extent that last autumn it seemed that the lower growing Sophie’s perpetual was almost completed buried. From the original 12 Gaura plants that had been planted between the groups I removed about 36 plants that had grown since 2009. 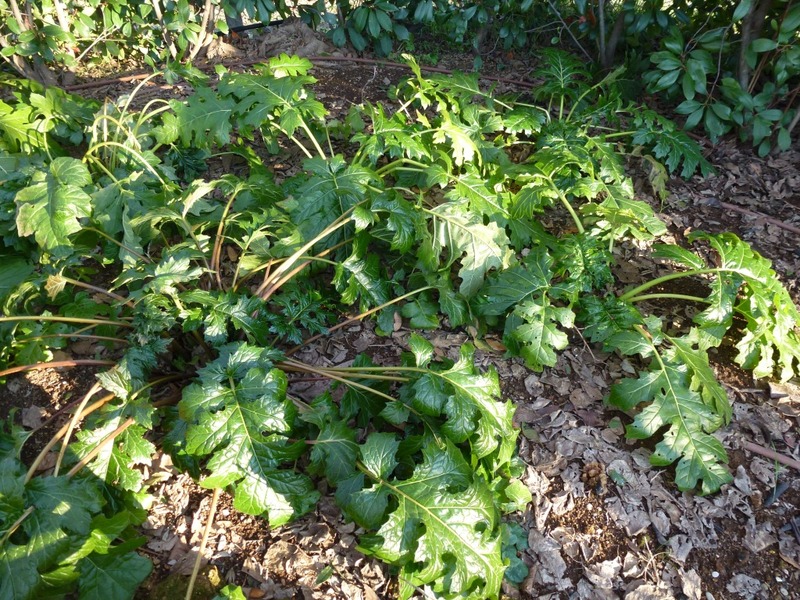 I had already removed many, very many seedlings from this bed and used them on the slope and in client’s gardens. I don’t really understand why they self-seed so much better in this bed than anywhere else; it could be because this bed has irrigation for the roses. So the question was, what to do with all these plants, the compost heap seemed an impossible choice, I love the butterfly blooms of the Gaura floating amongst plants for so much of summer and into autumn. September 2011, where are the roses in the rose bed? UNDER the Gaura! 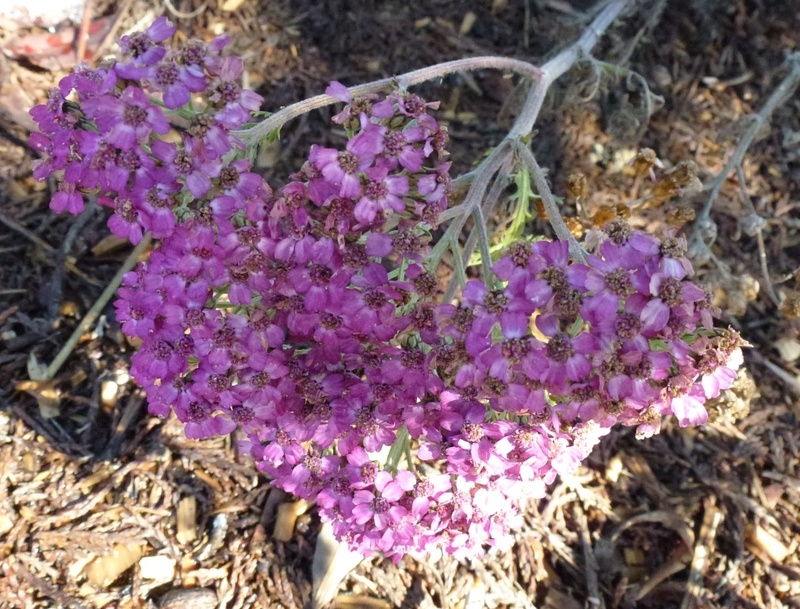 They are one of the few consistently flowering plants in late July and August. 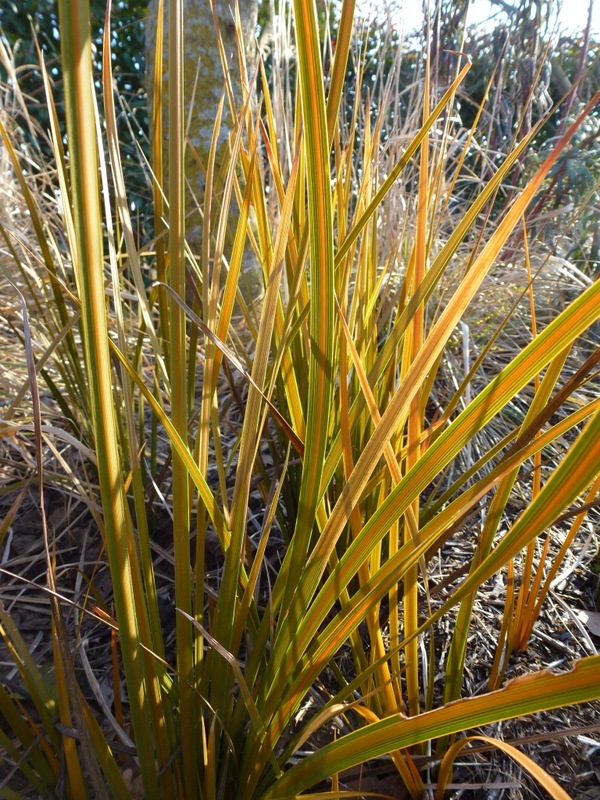 I have been considering adding another something to join the Perovskia in the formal beds. The front two are under-planted with white tulips and Allium although I’m not sure how many will regrow this year, they were planted in 2008. I was already thinking about transplanting some of the many dwarf hyacinths that are becoming overcrowded in other beds and under the olives. 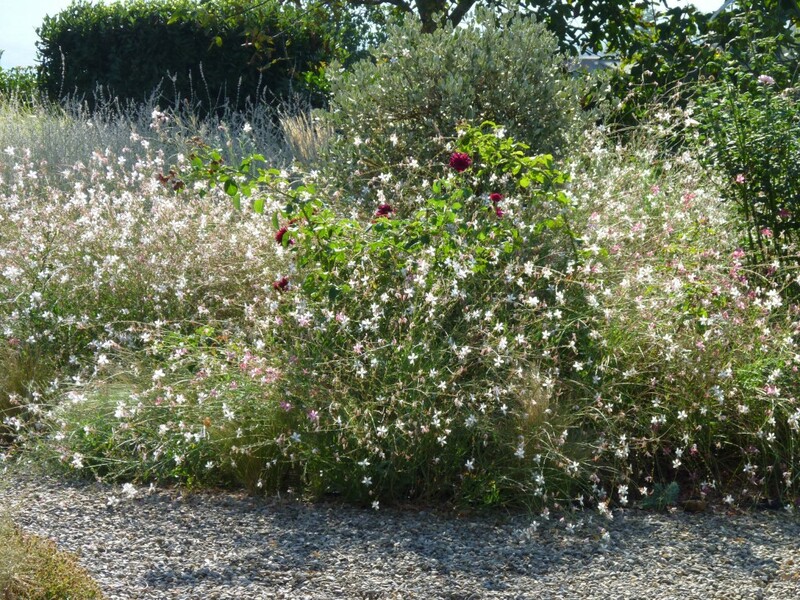 So I decided to experiment with planting the Gaura into the back two beds. I’m half way through planting one bed and I’ll use some of last year’s seedling plants to complete at least one bed. This month I have pruned the Wisteria ‘Prolific’ on the pergola. I made the decision to prune all the roses despite the fact that they had retained most of their leaves and were in no-way dormant, some including ‘Rhapsody in Blue’ even had new viable flower buds; like ‘Wellywoman’ despite wearing leather pruning gloves my wrists and the backs of my hands are covered in scratches! All the Perovskia has also been pruned; again much earlier than I have pruned them before. 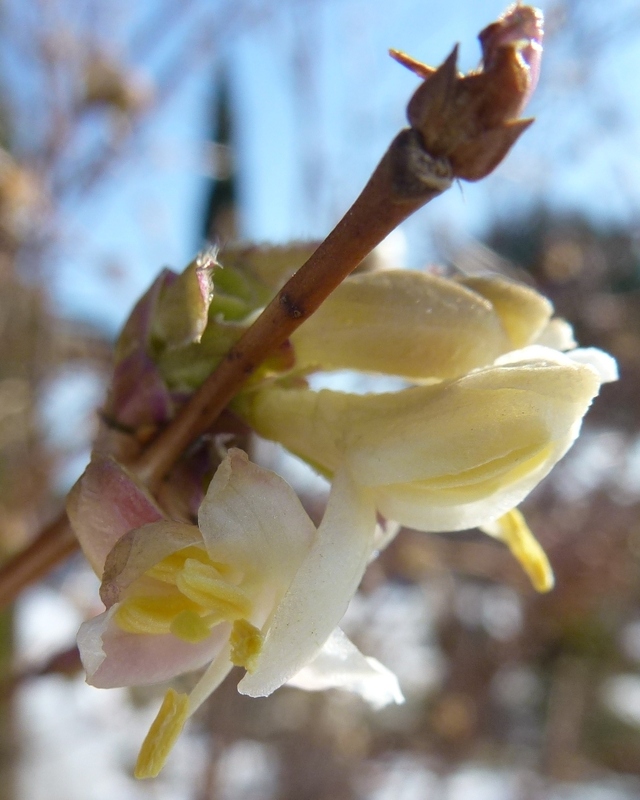 As soon as the sun shone Lonicera fragrantissima opened new buds, I have this shrub planted near where we park so when you get out of the car you are greeted with its delicious perfume. The very best thing about February is that sunset is later and later each day; very noticeable on sunny days, it is now gone 6pm when the sun sinks below the horizon and at 5pm it feels like the middle of the day instead of dusk. The disadvantage of being closer to the equator and having more light in winter is that in summer it is dark earlier than I am used to in Southern England, but it is a price worth paying. Thank you Helen, the Patient Gardener for hosting this useful meme; if you would like to see what others have been doing in their gardens this month follow the link to see what’s happening around the world. 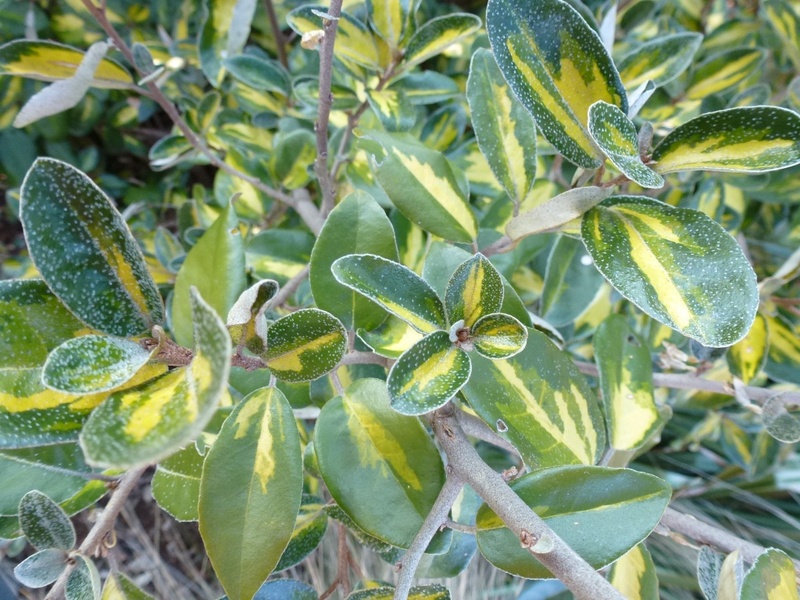 For a couple of weeks there hasn’t been much foliage visible in My Hesperides Garden; snow buried everything but now green is emerging from white and colour returns to the garden. 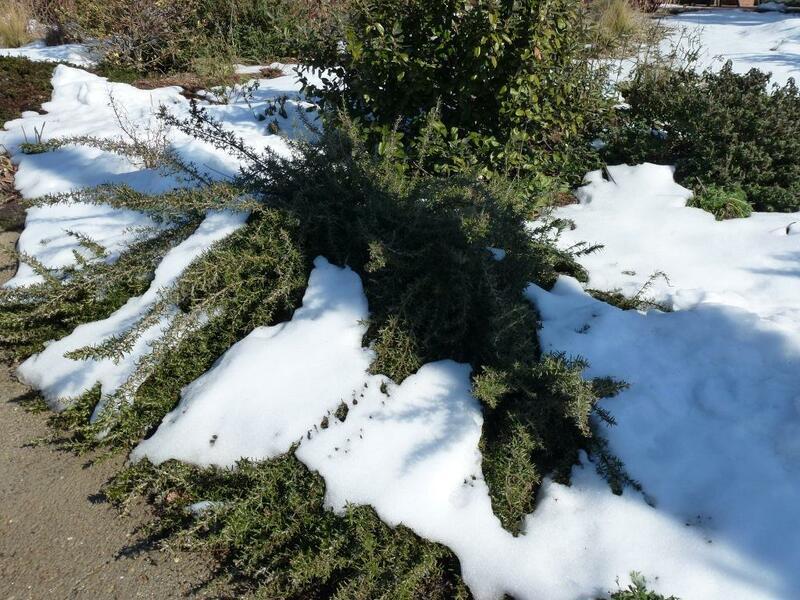 Snow can damage evergreen plants; pushing down the branches; the box were splayed open. I wanted to brush the snow away and take the weight off the stems but the branches were also very brittle in the freezing temperatures and I didn’t want it to be me to cause the damage. The evergreen shrubs I planted are now beginning to give the structure I wanted to the planting. 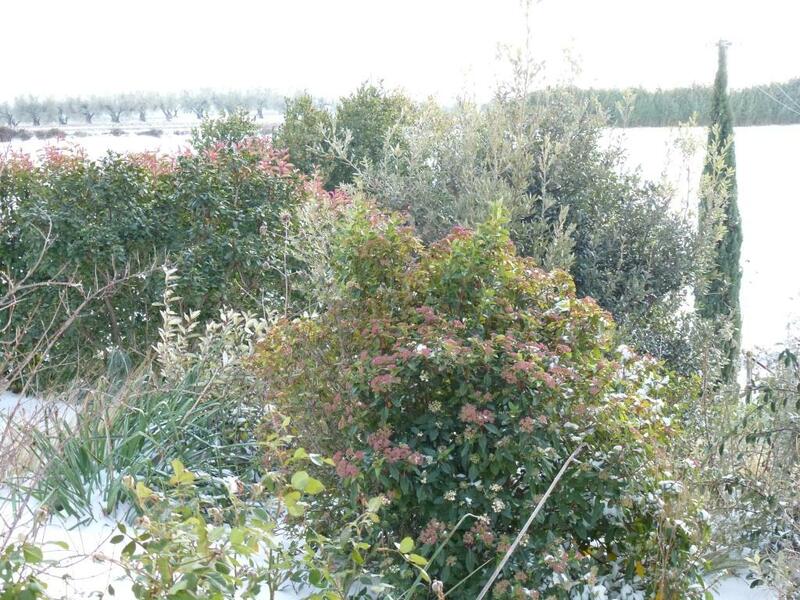 In summer with herbaceous plants flowering they tend to fade into the background but in winter with, or without, the snow they add form, mass and height to the borders. 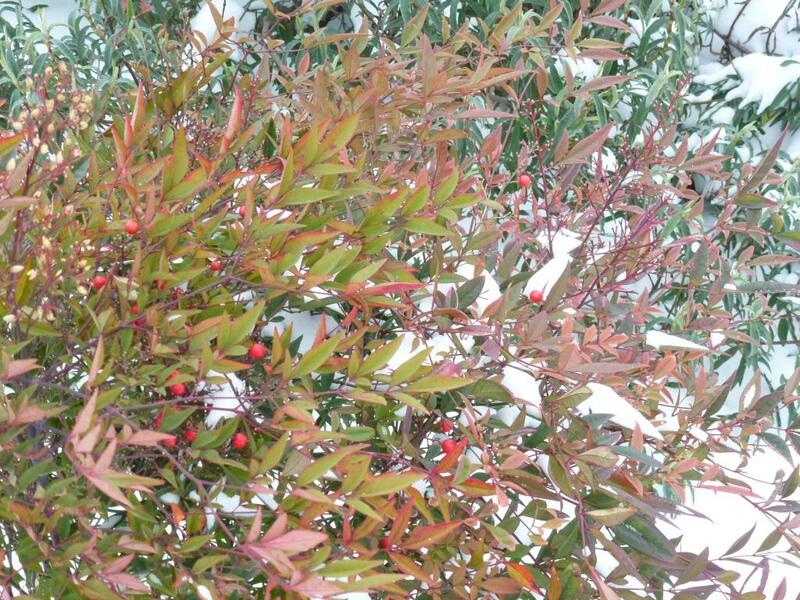 I like the solid form of this Eleagnus – it has formed this shape naturally, I haven’t pruned it to make it solid. 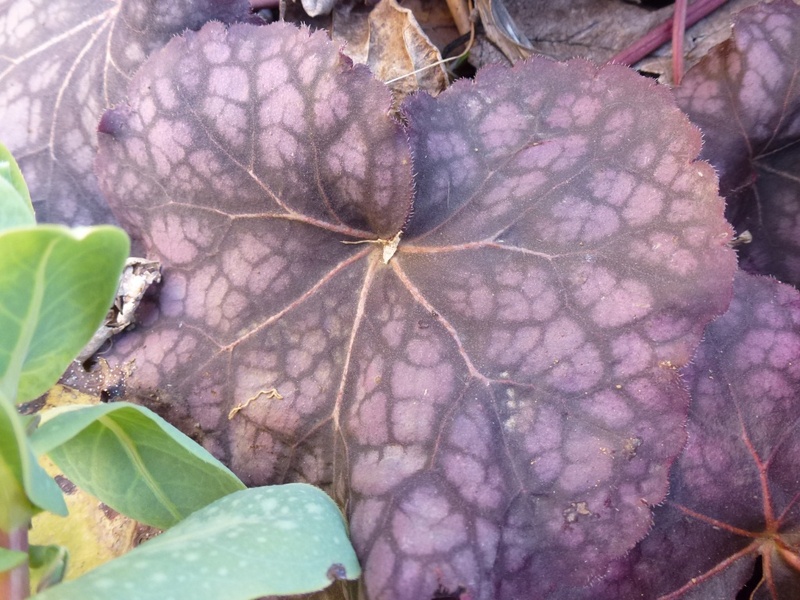 If possible I choose plants that will grow into a beautiful shape naturally as I’m not keen on plants that have been pruned to death! Today the 21st the sun is shining and the temperature has risen significantly, from hardly topping zero centigrade to today’s warm 10 or more in the sun degrees. 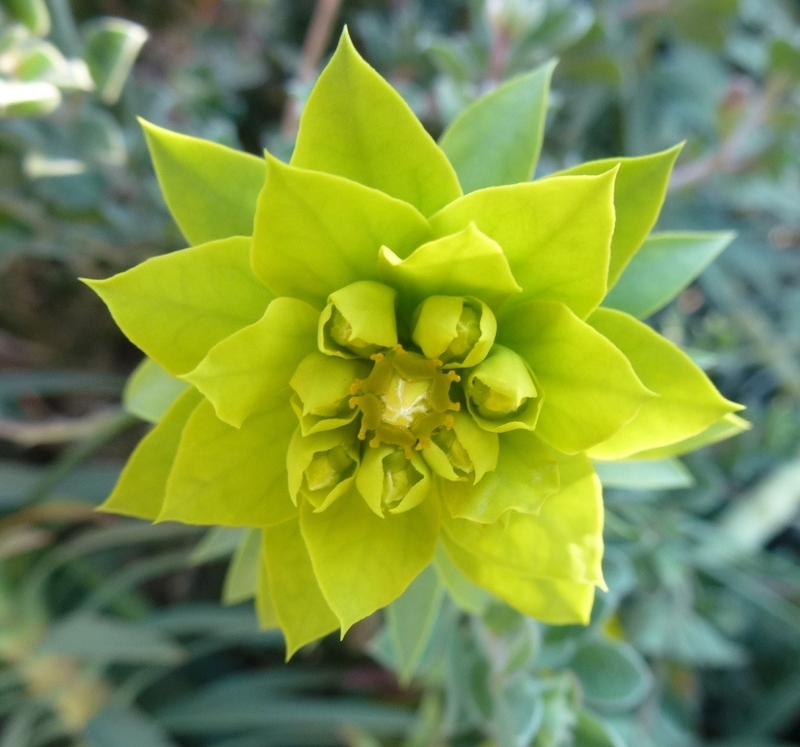 Euphorbia rigida is anything but rigid but coloured bracts are beginning to turn their faces to the sun and suddenly it feels that spring will be here soon. 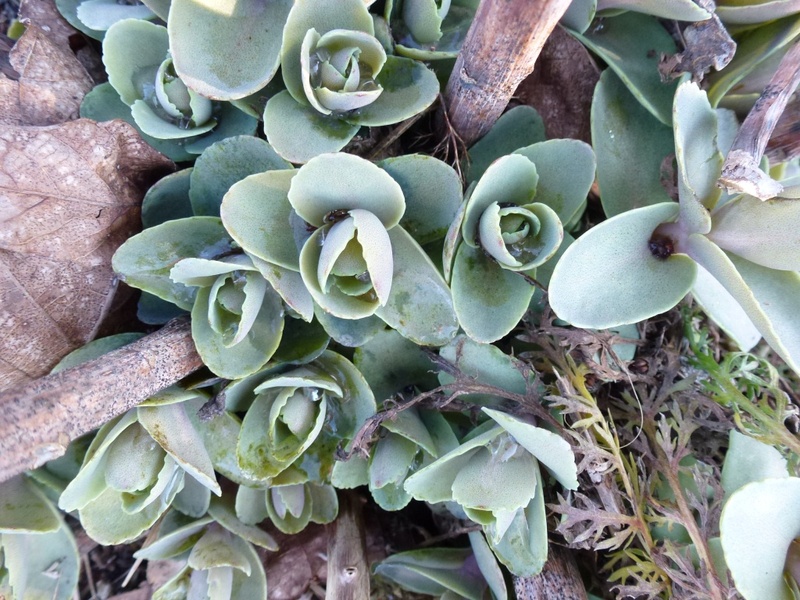 There is new foliage emerging from under the dead stems of sedum, I will have to remove the old stems and I will lift and divide the plants that are very large to increase their numbers; I would like to mass-plant some Sedum onto the bank. What foliage is giving you pleasure at the moment? 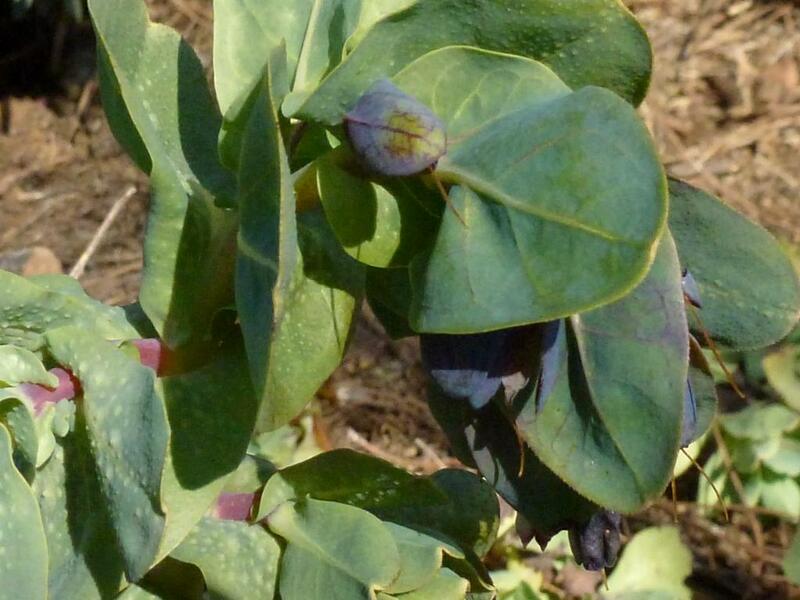 Do leave a comment and link to your post on foliage this month. It can be about just one plant or your whole garden, whatever you like. 2012.02.15 GBBD What a difference a year makes! In 2011’s February Bloomday I was full of hope talking about spring being just around the corner with bulbs flowering and tulips shoots coming through. I boasted that I was ahead on work especially weeding and I remember enjoying seeing all the signs of life to come, well what a difference a year makes! 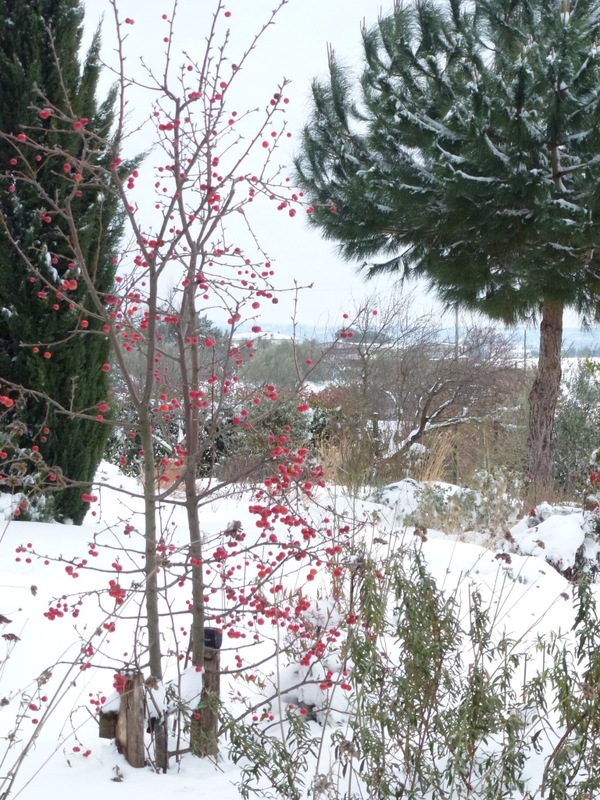 My Hesperides garden is still covered in snow, now icy and hard. It thaws a little each day but it is difficult to imagine that very much is really growing. Luckily I used a lot of mulch in the last year so hopefully weeding won’t be too much of an issue. As you may have seen in January’s GBBD post there were still many roses blooming and everything had new shoots, I was panicking about when I was going to prune the roses as they didn’t seem to be having a dormant period. Luckily I pruned the Wisteria on the pergola at the front of the house; the white ones on the side are still waiting. Many of the roses still have foliage, turned red to protect the plants; as soon as we have a few warmer days I will prune all the roses and move one that I want to add to the new planting I made in autumn. The garden needs the moisture that the melting snow will provide; we’ve had very little rain since the deluge in September. The ground water levels need to be high before the long drought of summer. 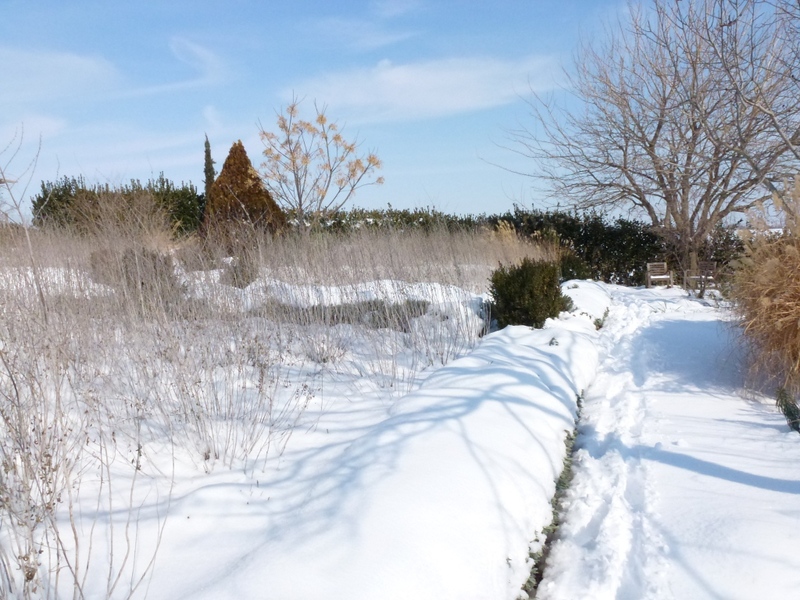 The snow has high-lighted how many birds now live in the garden; when we moved here, there were few plants to help feed the birds during winter, now there are more hedges for the birds to nest in and many seeds and fruits for them to eat. In the snow I saw the impression of wing beats of the Little owl where it had taken some small bird or perhaps a mouse, I left a few pomegranates on the tree and the fruit has been pecked clean; although I’ve seen birds on the crab apples they don’t seem to be actually eating them as the tree is still full of tempting, cherry red fruit. I do see the birds clinging to the grasses and so I imagine that they eat grass seeds. 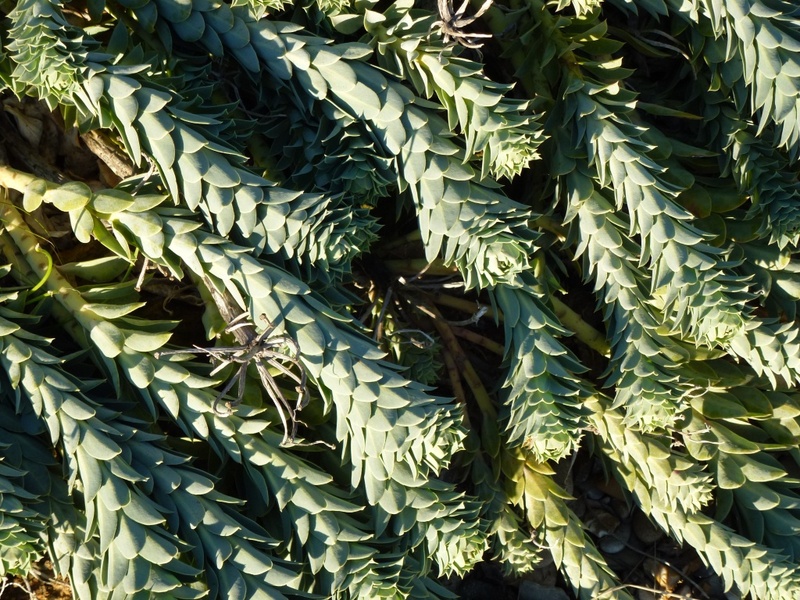 I leave most seed-heads during the winter for their interesting forms and also to the birds. This is the first 15th of the month when there have been no flowers for a Bloomday post; so now I understand why Carol dreams of May! I’m dreaming too this month so if you want to see some terrific blooms from around the world visit Carol at Maydreamsgarden. Carol has more blooms than me this month so this might her fell happier. Don’t forget Garden Blogger’s Foliage day on the 22nd of each month; what’s looking good for you foliage wise? Italy has been is chaos for the last week. 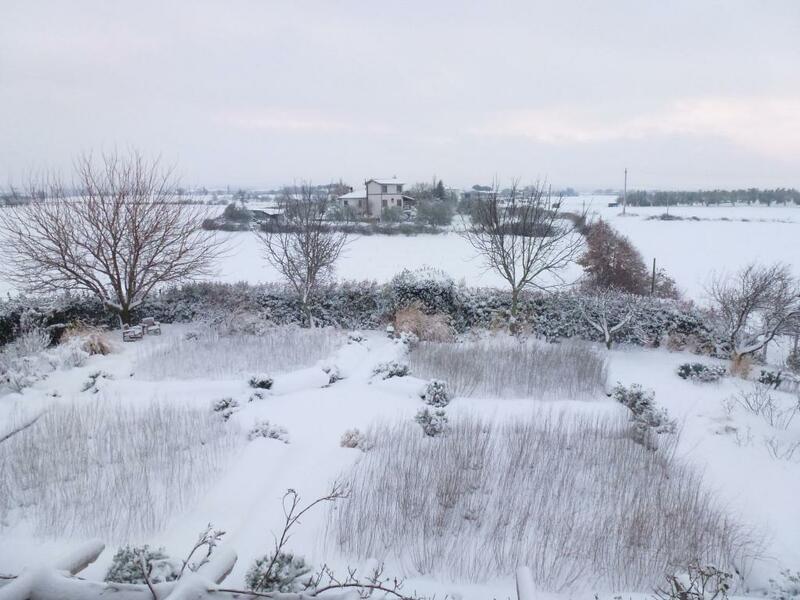 Snow has fallen in huge quantities over much of the country including Rome and the South where it is more unusual for there to be very much snow. To say it caught everyone unawares is an understatement. The schools in Rome have been closed for the last week and all public offices were closed for 3 days, and not a great deal better in Viterbo. It began snowing on Friday 3rd February. 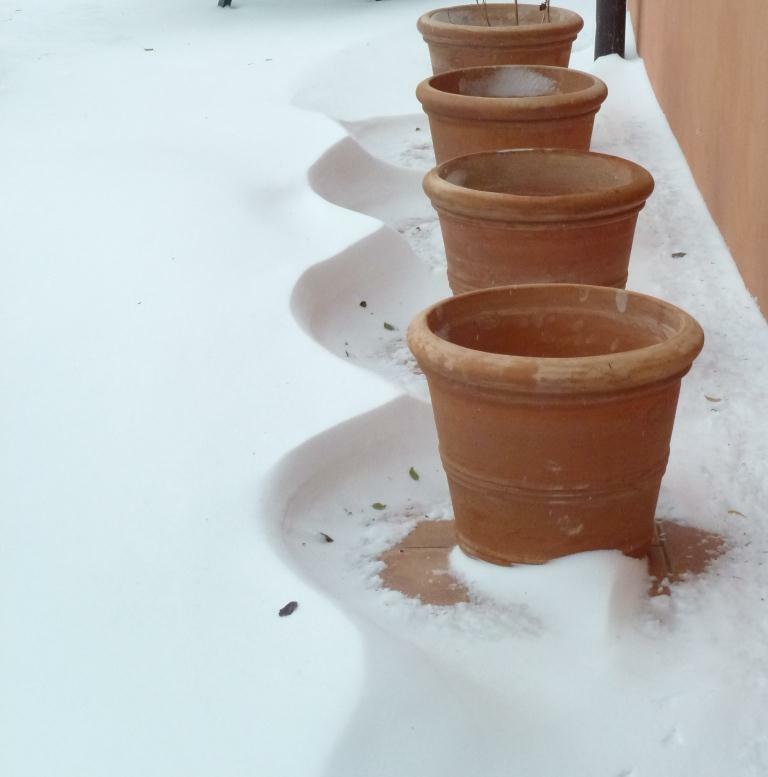 Here the flakes were small and icy and the wind was so strong that it wasn’t beautiful at all with deep drifts where the wind dumped the snow and poor icy-stemmed plants being bent horizontal by the North –North East wind that was said to be coming from Siberia. The lane to our house was cleared by a friendly farmer on Sunday afternoon but the wind covered it with snow again so that it was very difficult to get out. The NG struggled to the station on Monday morning only to find that there were no trains. I didn’t get out of the house until Thursday; by which time I was feeling quite stir crazy. Friday seems to be the day for snow and last Friday (10th February) we awoke to already deep snow – it continued all day and continued until just after midnight. 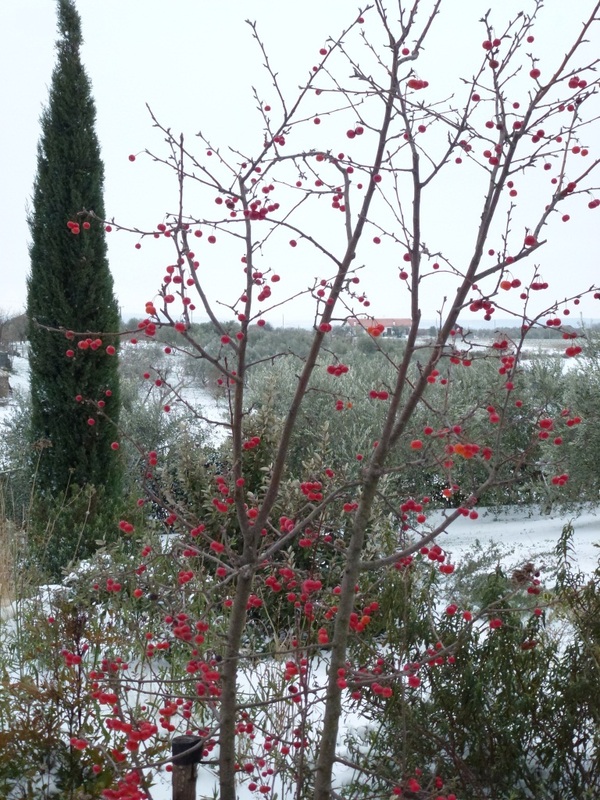 This snow, with less wind was beautiful, deep and crisp and even making the garden a magical place. We haven’t had anywhere near as much snow as this since we moved to Italy in 2003; in fact I don’t remember seeing this much snow except when in the mountains to ski. same view on Saturday 11th Feb. 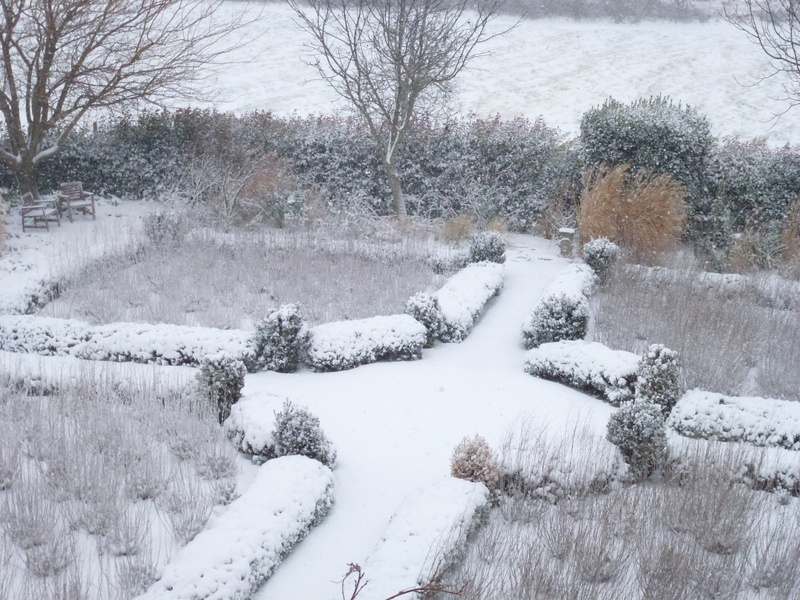 In the above image you can’t see the lavender hedges at all; they are entirely enveloped in snow; today (Sunday) I removed the snow from the box cubes because the snow was breaking the shapes open and I worried that some stems would be broken. The town is more organised this week and yesterday evening a tractor with a snow shovel came to clear the road and the lane to our house, we had to clear the 100 metres of drive ourselves this morning. 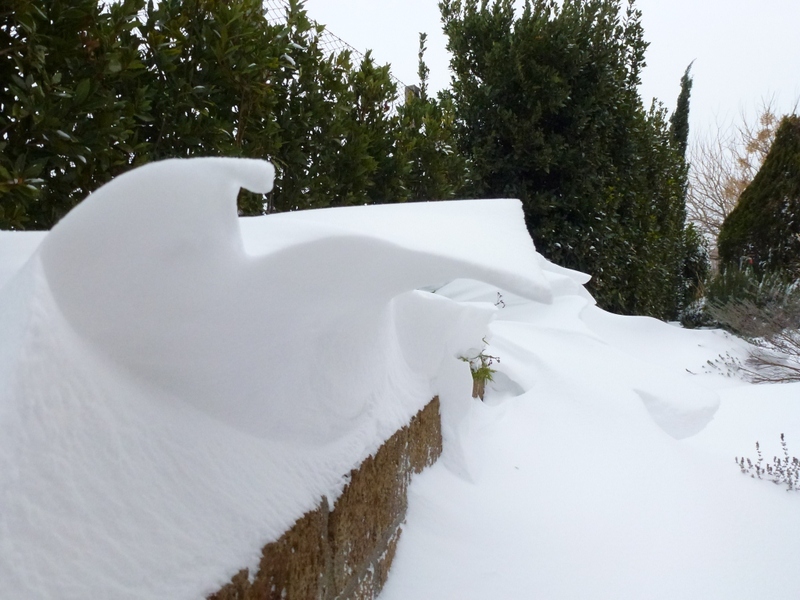 We are now hoping that the wind doesn’t deposit too much of the surrounding snow back onto the lane. Inside the greenhouse things are rather different. 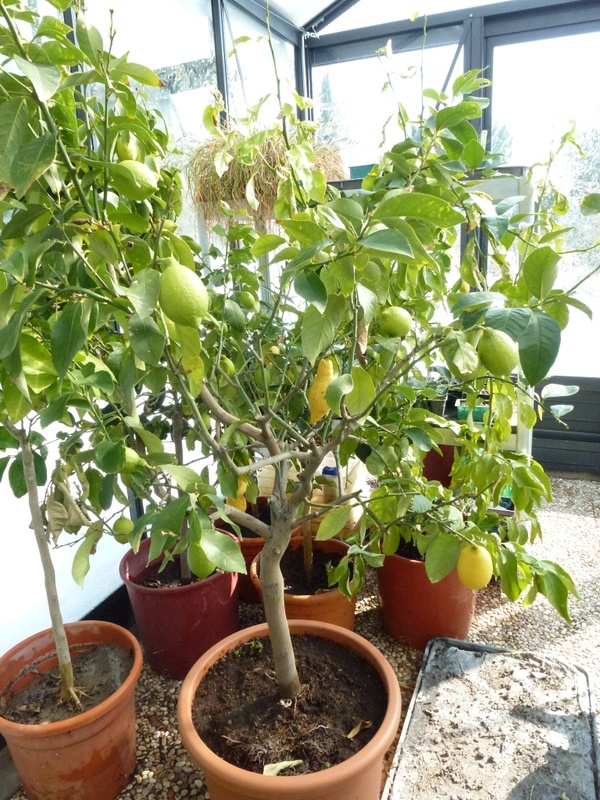 It is protected from the cold winds by Leylandii and Olives, so much so that the automatic roof lights have been opening and inside I have been forced to water everything. I was very worried about doing this as if the night temperatures drop very low the plants will suffer but they were actually wilting so I had no choice. 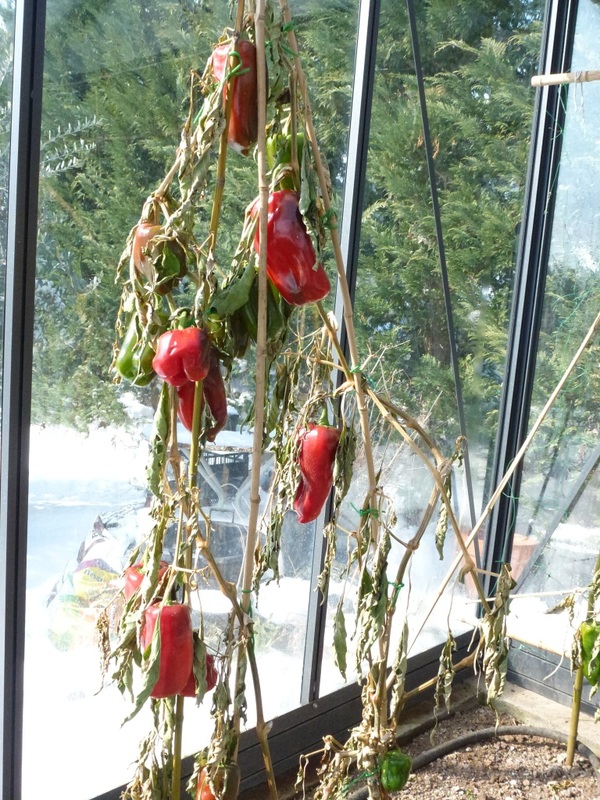 An update on the peppers that I left to grow during the winter, I am astounded even with temperatures that have only crept a little over zero for the last 10 days the peppers are ripening, slowly yes, but they are ripening. I harvested some during the week when vegetables outside were buried. They even tasted very good! 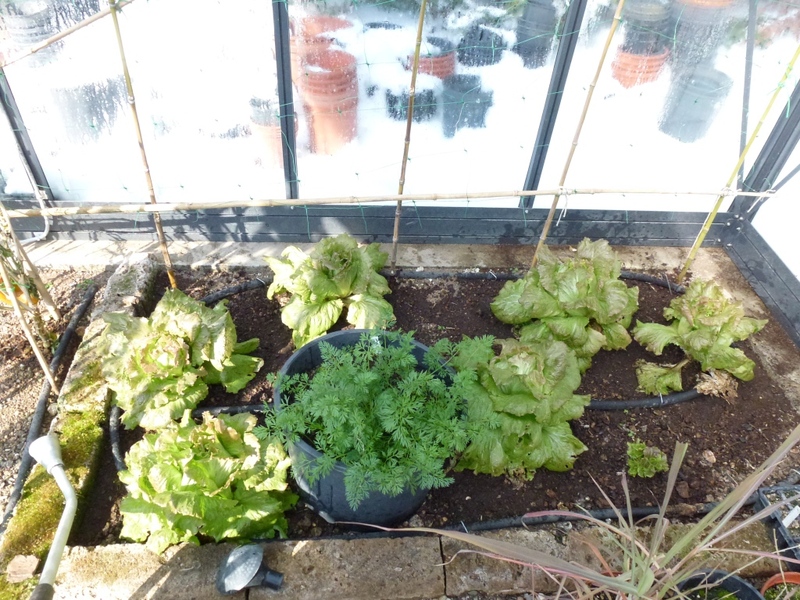 There are also lettuces that take longer to bolt in the cold so we may even manage to eat them all. In the pot you might recognise carrot leaves, I’ve never had success growing them outside so followed an idea from an Italian gardening magazine and I’m trying them in a large pot. In the garden the only colour is from fruits and berries, the bright red of the crab apples attracts the birds but they don’t actually eat them, I’m not sure why.